Thierry Warin’s interests include financial regulations, international finance, open macroeconomics, international political economy, regional economics and global development finance. Thierry is Associate Professor of International Business at HEC Montréal. Thierry is Vice-President Strategy and International Economics at Cirano (Canada). Thierry was Associate Professor at Polytechnique Montreal (Director of the International Projects Program) and Associate Professor at Middlebury College (Director of the International Studies and IPE program). Thierry has authored numerous academic publications and books or special issues. 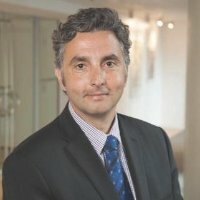 An alumnus of the Salzburg Global Seminar, Thierry held positions in several academic institutions (Middlebury College USA, Polytechnique Montreal, Sun Yat Sen University Guangzhou, Essec Business School Paris, HEC Paris, La Sorbonne, UIBE Beijing). His research is mainly on international economics and finance topics, with a particular focus on European economic integration. Thierry is also interested in economic development and has done research on this topic in the Balkans for the World Bank and Haiti for the Inter-American development Bank. He is currently president of a small NGO called Ed’Haïti. An alumnus of the Minda de Gunzburg Center for European Studies at Harvard University, Thierry completed his doctorate in monetary economics and finance at Essec Business School in Paris.